Simply Sassy Media is hosting a Summer Launch Pinterest Party! The prizes are your choice of either $100 Target Gift Card or $50 Amazon Gift Code. It’s open to USA and Canada and will end on July 25, 2012 at 11:59 pm EST. Pinterest parties are fun and easy! I actually won my very first one last week from Pur Minerals. Check out the image below for details on how to participate. Check out my sample board to see an example of my fairytale wedding. Simply Sassy Media also has a board for a dream kitchen. The winner will be selected by random draw from the boards who followed the rules listed above. One entry per person. 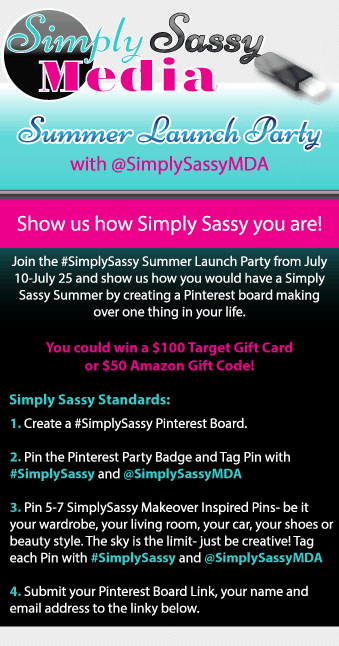 Make sure to follow Simply Sassy Media on Pinterest and tag them and add the hashtag #SimplySassy in each of your pins! Add the link to your board to the linky below. look forward to my visits with simply stacie!